The simplest method ever devised for accumulating cartons, boxes, etc. Basic design eliminates complicated adjustments and allows a minimum of 2% back pressure. Bed - 6-1/2" deep x 12 ga. formed steel channel frame powder painted. Rollers - 1-3/8" dia. x 18 ga. galvanized tread rollers spaced every 3" and 1-3/8" dia. x 18 ga. galvanized pressure roller spaced every 6". Overall frame widths: 12", 15", 18", & 24". Motor - 1/2 HP standard-1 HP max. 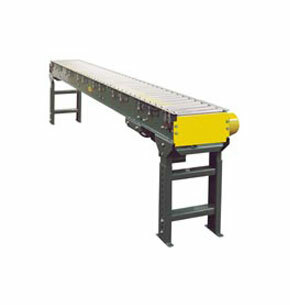 Capacity - Maximum load per linear ft. of conveyor; 50 lbs., not to exceed rated capacities. Finger tip pressure roller adjustment-no tools required.